From the especially recession-stricken state of Michigan this week, an interesting development in former-stadia news. 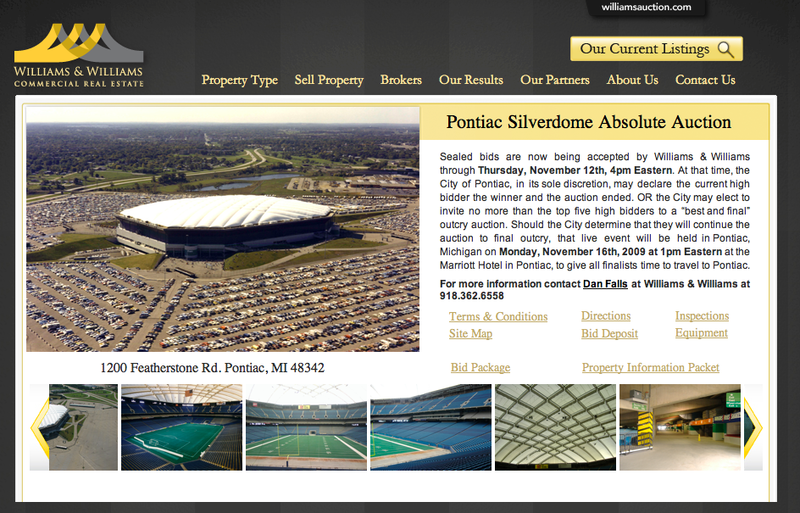 The Pontiac Silverdome, namesake of the Detroit-area suburb, was auctioned off this week to a Toronto-based investment group for $583,000. 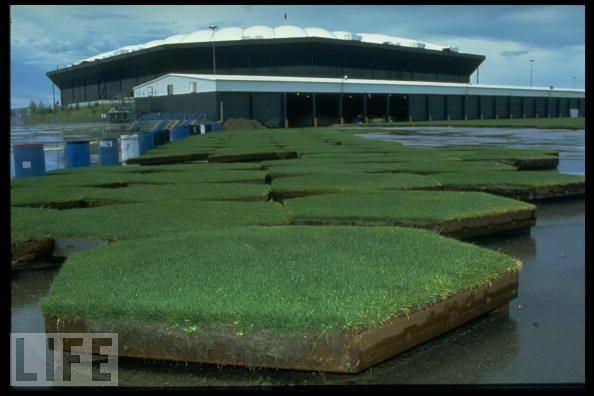 This is good news because selling the Silverdome will save the city nearly $1.5 million per year in upkeep. The problem? The facility, which opened in 1975 and cost taxpayers $55.7 million to build, was estimated (by local realty experts) to sell for double or nearly triple the paltry amount of $583,000 that won the city of Pontiac's auction. This, one year after a $20 million contract for the facility fell through. A steal of a deal? Yes. A sign of the times in Detroit? Sadly, yes. The same arena that served as the venue for Barry Sanders' magical football prowess was more memorable to me, as a soccer fan, for hosting several games during the 1994 World Cup. A crowd of over 73,000 was there to witness the first indoor World Cup game ever, a match between Switzerland and the United States (it was the US' first World Cup game on home soil). Don't you remember the real grass they had to, literally, wheel in? That game ended in a 1-1 draw, with a notable Eric Wynalda free kick in the 45th minute that tied the contest and gave the U.S. their first points in a World Cup since 1950. Just listen to the crowd reaction...and, as a bonus, look for the god-awful jerseys the U.S. are wearing. Now, rumors are swirling that the Toronto-based investment group plan to refurbish the Silverdome and use it to lure an expansion Major League Soccer franchise to the city. That kind of activity would be a welcome change from the dormancy that has plagued the building since the Lions moved to downtown Detroit's Ford Field to start the 2002 NFL season (the city was so desperate that it tried - and failed - to use the Silverdome parking lots for a drive-in movie theater). But, if those plans don't come through (MLS is not currently entertaining expansion in Detroit), there will be questions surrounding what can be done with such an historic building. Unfortunately, nostalgia doesn't pay Pontiac's bills, but I can't help but feel sad to see historic stadia destroyed, nay, wiped from existence on this planet. Yet, without a use for these former stadia - like Detroit's Tiger Stadium or Baltimore's Memorial Stadium - and given the current economic climate (no funds for redevelopment), demolitions are imminent. The biggest question, I think, is if these are historic structures - why aren't we keeping them around? Certainly, historical societies, religions, and local and national governments have done the work to maintain certain historical sites...why is sport different? Wouldn't the aura or presence one feels walking the halls of Monticello, perusing the cannons at Fort McHenry, or hoisting the sails of the USS Constellation the same that one feels when entering the Silverdome? And if so, isn't that worth preserving? I can only be thankful that the Silverdome hasn't been razed...yet. There is something inside that building that beckons. Barry Sanders and Eric Wynalda await.